In Asia people cure colds with soup. In Indonesia with chicken soup, in Japan with Miso Soup, and its blend of simple ingredients contain a veritable shopping list of nutrients and health benefits that help to prevent one of the most deadly diseases waging war upon our bodies. Breast cancer. Studies show that simply consuming one bowl of miso soup per day, as most residents of Japan do, can help cut the risk of breast cancer. This is attributed to the magic ingredient of fermented soy paste, used to make miso. Some health advocates request that you eat more than one bowl per day, but an argument against that recommendation is that miso soup also contains high quantities of salt, and so consumption should be regulated. Tofu is also said to help regulate the hormone oestrogen in women, a hormone that can cause tumors to develop. Though research into this healthy characteristic of miso soup is still ongoing, there are still a bevy of other enzyme-like beneficial nutrients to help food digestion. 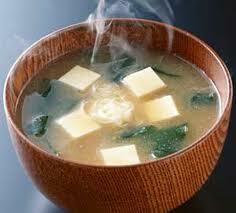 That’s why miso soup is served as an appetizer. Miso soup is rich with antioxidants and protective fatty acids, and a healthy dose of Vitamin E. It also boasts protein and Vitamin B12, and a nice selection of minerals to help boost the strength of your immune system. The wakame seaweed added to miso soup also possesses its own nutrients, helping to lower blood pressure and reduce cholesterol. The combination of wakame and miso is also said to be an effective fighter against nicotine-related disorders. Miso soup can be purchased in packets in the ethnic aisle of your local supermarket, in organic shops and at Asian groceries, but here is a simple recipe to make your own. If using not organic ingredients, make sure they are MGS and GM free. It uses miso paste, which will stay fresh in the fridge for months, and can also be used in sauces. Place dashi in a saucepan of boiling water. Once dissolved, add sliced soaked mushrooms and let simmer for 15′. Remove from stove and add the dried wakame seaweeds. Place the miso paste into a serving bowl and stir in a little of the stock until the paste is of pouring consistency. Gradually stir into the soup stock and add the cubed tofu. Divide the sliced spring onions into 6 bowls. Ladle the soup into the serving bowls, dividing equally the mushrooms, the seaweeds and the tofu. Serve immediately. This soup may be prepared ahead of time and kept for up to 5 days in a sealed container in the refrigerator. Do not let the soup boil or the miso and wakame will lose its healing properties and flavor. Add raw spring onions, just before serving.